With these additions, Ergoweb Enterprise has sixteen (16) evidence-based assessment tools to choose from. You can use all sixteen methods, or you can mix and match them to your unique work environment for simplicity. Why Have Many? Why Not Just One? A core principle in ergonomics is that One Size Does Not Fit All. Likewise, One Assessment Method Does Not Apply to All Types of Work Tasks. We don’t recommend a hammer as your only hand tool, and we don’t recommend a brief survey method as your only ergonomics assessment tool. We believe in applying scientifically-based tools to identify and quantify ergonomic concerns in specific types of work tasks. It’s much better to apply the NIOSH Lifting Equation to a lifting task, for example, than it is to apply REBA, or some other brief survey method to that same lifting task. And sometimes it’s worthwhile to apply more than one assessment tool to the same task as you dig deeper into root causes and propose improvements. 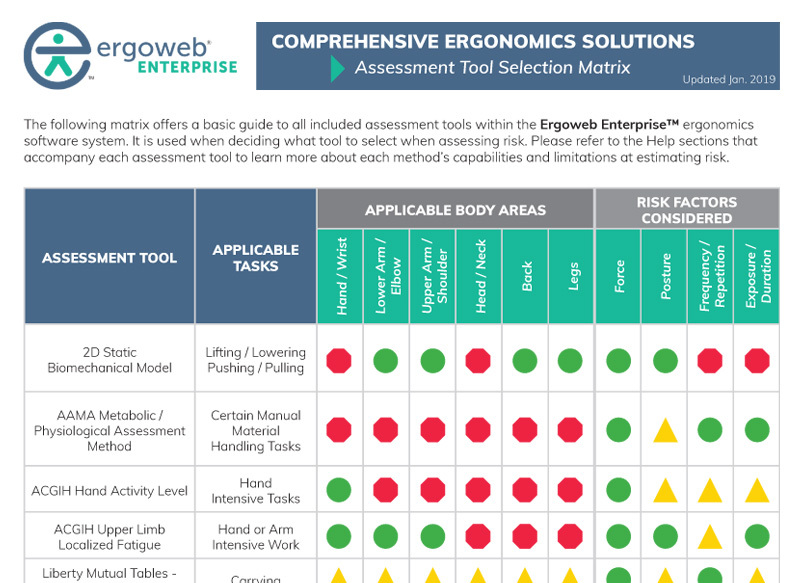 Ergoweb recommends a comprehensive set of tools that are specifically tuned to identify, quantify and prioritize ergonomic problems by task type. When measuring risk, we believe that details are important, and task-specific ergonomics assessment tools accomplish that far better than generalized methods can. Ergoweb Enterprise™ is a cloud-based ergonomics management software that allows companies to control their ergonomics programs and fulfill EHS regulation standards. The comprehensive system provides the necessary tools and resources to assess, quantify, and track improvement projects over time, creating a sustainable ergonomics initiative that pays for itself many times over. Request your live demonstration today. Also, certain types of tasks are known to affect certain body areas, so we’ve developed the Ergoweb Tool Selection Matrix as a simple guide to help you find the right tool for the right task. Eric B. Weston, Alex Aurand, Jonathan S. Dufour, Gregory G. Knapik, W. Gary Allread, William S. Marras, AN OBJECTIVE SET OF GUIDELINES FOR PUSHING AND PULLING, Spine Research Institute, The Ohio State University, Columbus, OH USA, undated manuscript last accessed 28 Nov 2018 at https://www.bwc.ohio.gov/downloads/blankpdf/PushPullGuidelines.pdf. Peter Budnick is the founder and president of Ergoweb, LLC – a 24-year old company that helps clients manage their ergonomics programs through its flagship service Ergoweb Enterprise™ – a cloud-based continuous improvement ergonomics management software. He is an industry leader in the ergonomics software space, has published extensively, and been a featured speaker at conferences, corporations, and training events. Peter’s extensive leadership roles include Director and President for the Board of Certification in Professional Ergonomics (BCPE), Chair of the International Ergonomics Association’s (IEA) Certification Subcommittee, and others. He is a Certified Professional Ergonomist (CPE) and holds a B.S. in Engineering from Michigan Technological University, a M.S. in Industrial Engineering from the University of Michigan, and a Ph.D. in Mechanical Engineering from the University of Utah.